On March 21 I had the opportunity to attend OperaWine 2015, an exclusive wine tasting event that serves as the preamble to the Vinitaly event in Verona, Italy. OperaWine is jointly organized by Wine Spectator and Vinitaly and it aims at showcasing 100 of the greatest Italian wine producers selected by Wine Spectator, thus recognizing excellence in Italian wine. The event is reserved to media and trade and is much more compact than Vinitaly. 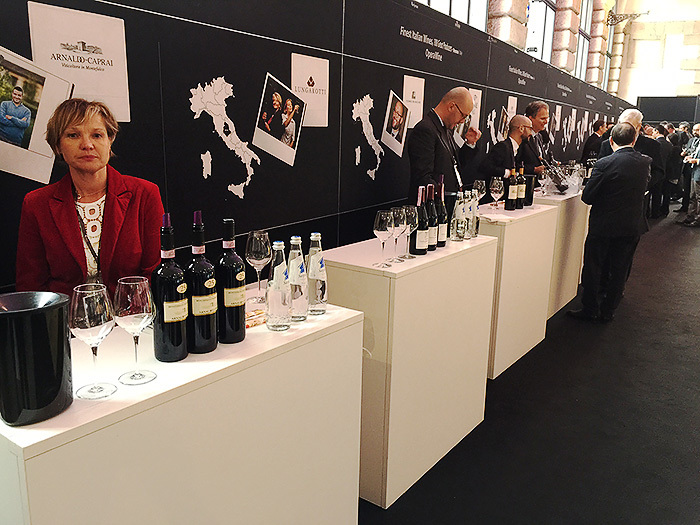 OperaWine took place in the beautiful context of Verona’s Palazzo della Gran Guardia and the organization was excellent: registration was straight forward and the booths of the 100 selected producers were laid out in a logical order. One thing the organizers deserve particular praise for is their decision to encourage selected producers to bring to the event (where appropriate depending on the wine they were showcasing) not the latest released vintage but an older one which would showcase the wine at or near peak conditions. This resulted in some pretty spectacular tastings, as you will see from my tasting notes below and the following posts in my OperaWine series. 3. It would be nice if there could be a few cheese, fruit and cracker tables here and there, pretty much as in all professional wine tasting events. This entry was posted in Red Wines, Sparkling Wines, White Wines, Wine, Wine Reviews, Winevents and tagged 2015, Anselmet, Barolo, Bruno Giacosa, Ca' del Bosco, Cavallotto, Ceretto, Chardonnay, Chiavennasca, Cuvée Annamaria Clementi, event, Fair, Franciacorta, Italian, Italy, Les Crêtes, Lunae Bosoni, Mamete Prevostini, Massolino, Nebbiolo, Nino Negri, OperaWine, Paolo Scavino, red, review, Rossese di Dolceacqua, Sandrone, Sforzato di Valtellina, sparkling, spumante, tasting, Terre Bianche, Vermentino, Verona, Vinitaly, white, wine, Wine Spectator on April 10, 2015 by Stefano.